The internet is a vast, complicated web of connection and anonymity that has the power to hide and unveil in equal power. The internet has connected the world in ways that history has never seen before; this includes the connection and fostering of ideologies both helpful and harmful. In the current political climate of the United States amid the rest of the world, white supremacy has been on the rise; terms such as the “alt-right” and “neo-Nazi” have been making headlines across the country, putting a term to those emboldened by anti-immigrant, anti-Semitic and other anti-minority sentiments. While these ideologies have existed for centuries, the 21st century has brought means by which people can connect, harboring these ideas over the internet, planning organized attacks and campaigning anonymously. Websites such as 8chan and Gab serve as the face of the alt-right and neo-Nazism, harboring white supremacists on discussion boards and amid news posts circulating across the internet. 8chan was created in Oct. 2013 by computer programmer Fredrick Brennan. Much like 4chan, 8chan is an anonymous discussion forum that can be organized into subforums surrounding specific topics. After witnessing what he believed to be a restriction on free speech and “authoritarianism” on the imageboard 4chan, Brennan created 8chan as a place to foster “free speech.” After Brennan’s resignation in 2016, the site was handed over to Jim Watkins, a businessman who provides the funding for the site. 8chan’s “Politically Incorrect” (/pol/) subforum has served as a community for white supremacy and members of the “alt-right.” Leading up to the midterm election in 2018, subforums of 8chan organized a campaign for Illinois Republican candidate Arthur Jones, a neo-Nazi and outspoken Holocaust denier, initially running as a write-in. He was placed on the ballot after running unopposed in the election primaries. Members of the subforum discussed tactics such as making him appear more typically Republican, like promoting slogans such as “America workers first” and “bring the troops home” that later appeared on the literature Jones was distributing to Illinois residents. Members of the forum also discussed tactics such as editing his Wikipedia page and working with him one-on-one to help build his campaign. Jones lost the congressional race to his Democrat opponent Dan Lipinski, but still gained almost 57,000 votes in Illinois. Participants of the /pol/ subforum regularly criticize Donald Trump, many believing he is being controlled by Jewish people in high-ranking positions of government or that he does not do enough to control immigration. Another popular site is Gab, known for its white supremacists and the alt-right community. The site describes itself as “a social network that champions free speech, individual liberty and the free flow of information online. All are welcome.” CEO Andrew Torba created Gab in response to the alleged censorship of “conservative media” on sites such as Twitter and Facebook. Notable users of the site include Alex Jones of the ring-wing conspiracy site “Infowars” and Richard B. Spencer, a notable American white supremacist. The site went under recent fire following the Pittsburgh synagogue shooting, as the shooter had an active account on the site itself. The site shut down for a week after the incident when partners such as Paypal and Stripe pulled their partnership from the site following the Pittsburgh shooting and the shooter’s presence on Gab. A server called Epik now hosts the site, which the attorney general of Pennsylvania issued a subpoena following a close investigation. Gab has faced numerous investigations after users have been found calling for the genocide of Jewish people and the killing of “leftists.” Many Gab members are strong believers that racial diversity in culture leads to “white genocide.” Much like on 8chan, posts on Gab include discussion posts centering around Jewish people bringing “invaders to our border,” referring to the immigration caravan from South America, and other strong anti-Semitic beliefs across different political groups. 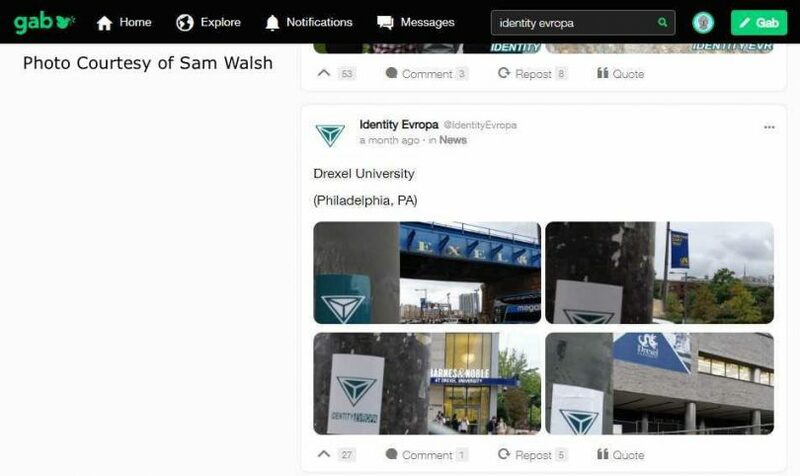 White supremacist groups have mobilized outside the internet, with groups such as Identity Evropa appearing on college campuses. Nearly 6,000 people follow the group on Gab and over 30,000 follow the group on Twitter. Members of the group have posted information on campuses such as Millersville University and Drexel University in Philadelphia. Other places in the city like the Museum of American Revolution in Philadelphia have been targeted by the group, as well as numerous locations across the country in nearly every state. Online, the hashtag #ProjectSiege tracks the group’s outreach. The Southern Poverty Law Center keeps track of hate groups across the country under different criteria such as “Neo-Nazi,” “Racist Skinhead” and “Anti-LGBT.” Several neo-Nazi and white supremacy groups exist in southeast Pennsylvania, including Identity Evropa, the Aryan Strikeforce and the Loyal White Knights of the Ku Klux Klan. Lisa Patrick, an English and Spanish dual major and former president of Hillel on campus, spoke about the culture of anti-Semitism that exists today. She said that the recent surge of anti-Semitism comes as a “shock and surprise” to people who aren’t Jewish. Patrick spoke of the many different denominations of Judaism and how, as a culture, people don’t understand the complexities. She said Judaism is a “wonderful and thriving culture” that is not simply something that has been threatened in the past. Students can follow the Southern Poverty Law Center’s “Hate Map” at https://www.splcenter.org/hate-map to keep track of different extremist groups across the United States. Jewish students who may experience acts of anti-Semitism are encouraged to reach out to the West Chester University Hillel Jewish Student Union.